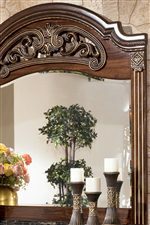 This traditional nine drawer dresser and mirror combination piece highlights the beautifully replicated mahogany grain featured in the bedroom collection. Nine spacious drawers sprawl out across the dresser's generous front, which includes a stepped out middle section for added depth in the center drawers. 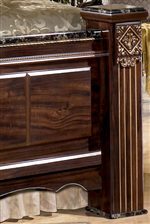 Framed top drawers with gilded bead detail draw the eye upward, where an elegant black marbled surface forms a beautifully resting place for the coordinating mirror with carved top and beveled pane. 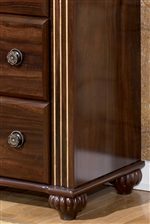 Side roller glides make for effortless operation of all nine drawers and antiqued gold hardware provides a polished finish to the entire piece. 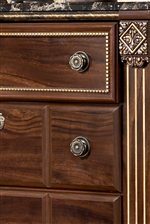 Pair with the matching three drawer end table and five drawer chest for refined, traditional bedroom decor. The Gabriela 3PC King Bedroom by Signature Design by Ashley at Miskelly Furniture in the Jackson, Pearl, Madison, Ridgeland, Flowood Mississippi area. Product availability may vary. Contact us for the most current availability on this product.